Upper Wapsi in the News! Construction is expected to begin later this year on a project intended to reduce flood impacts and improve water quality in the Wapsipinicon River. “The main focus is flood control, which will help everybody downstream. 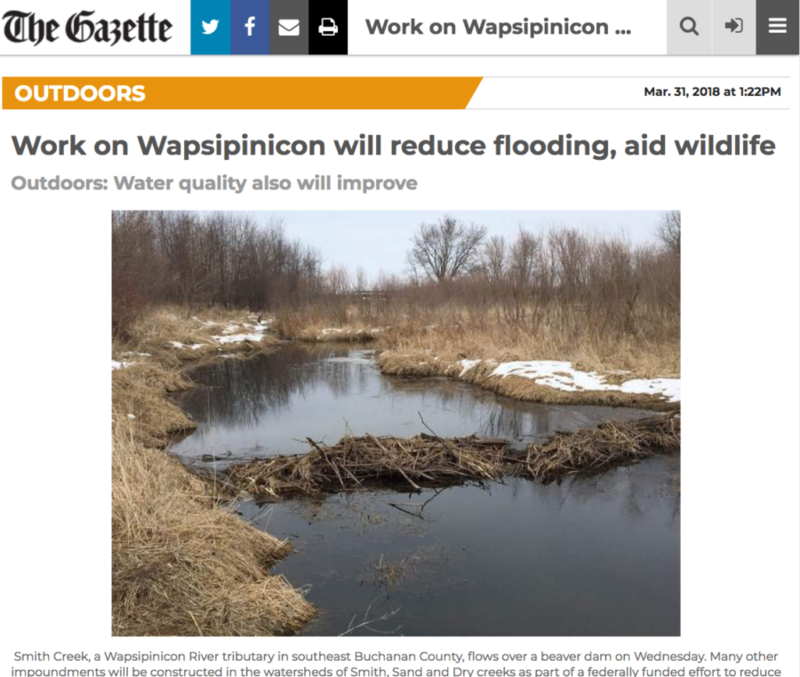 But the projects also will improve water quality and create wildlife habitat,” said Angie Auel, coordinator of the Upper Wapsipinicon River Watershed Management Authority. Within a targeted area in southern Buchanan County, more than $2 million is available to help fund construction of conservation practices to mitigate downstream flood damage, Auel said. 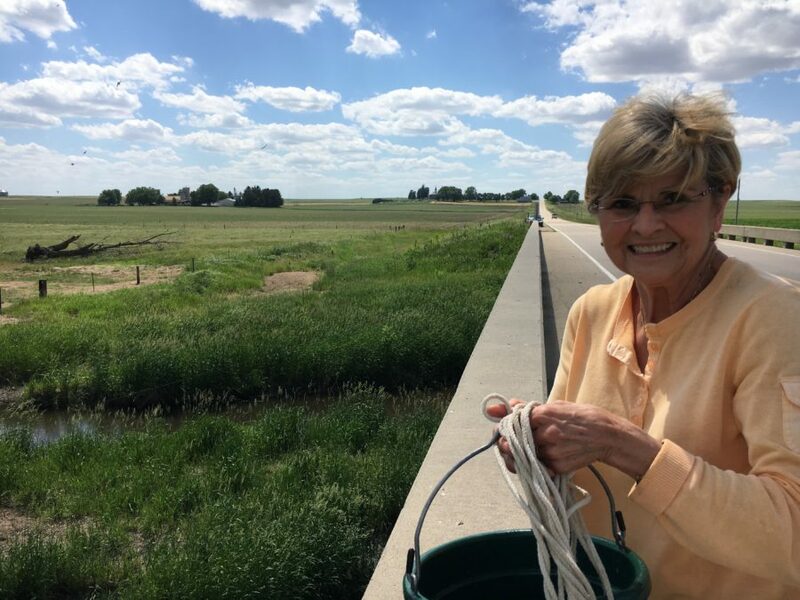 Volunteer landowners in three sub-watersheds — Smith, Sand and Dry creeks — may be eligible for 75 percent cost-share assistance for farm ponds, wetlands, saturated buffers, terraces, water and sediment control basins, oxbow restorations and other best management practices, Auel said. The river and creek bottoms in the target area have many oxbows created when the streams changed course over the years, she said. Oxbow restorations, in which the depressions are deepened and reconnected with their original streams, have, in addition to their water storage and treatment capacities, great potential as habitat for waterfowl and aquatic animals, including as nurseries for juvenile fish, Auel said. “It’s geared toward flood control with practices that hold back and slowly release excess water. It has the potential to do some really good things for Iowans and the environment,” said Dan Cohen, director of the Buchanan County Conservation Department. The $4.4 million awarded to the Wapsipinicon project is part of a $97 million U.S. Department of Housing and Urban Development grant intended to make Iowa more resilient to flooding and to reduce nutrient pollution. Auel said about half the $4.4 million will pay for development of a comprehensive watershed plan with the remainder funding best management practices in the targeted area. “When you reduce flooding, you also reduce sediment and nutrient pollution. They go hand in hand,” said watershed planner Ross Evelsizer, Friest’s colleague at the RC&D. “We want to quantify the benefits and develop an approach that can be replicated in large watersheds throughout Iowa,” said Antonio Arenas, an associate research engineer with the Iowa Flood Center. Similar HUD-funded projects are underway in eight other watersheds: the Middle Cedar, Upper Iowa and English rivers, as well as Clear Creek and Bee Branch in Eastern Iowa, and the North Raccoon, East Nishnabotna and West Nishnabotna rivers in western Iowa. Arenas said Iowa’s flood-prone status is well illustrated by the 951 county-scale flood-related presidential disaster declarations it has recorded from 1988 to 2016. Among the 50 states, Iowa ranks fourth in that category behind Texas, Missouri and Kentucky, he said. Among Iowa’s 99 counties, Clayton is alone at the top with 17 such declarations in the 29 years covered by the Flood Center’s analysis. But Buchanan, Butler, Des Moines and Fayette counties, tied for second with 16 declarations, are close behind, Arenas said. Learn more about the Wapsi Watershed! Everyone--from landowners to communities--has a role in reducing runoff and preventing flooding! The Wapsi WMA is working on a long-term plan to reduce flooding. Learn more about the WMA! 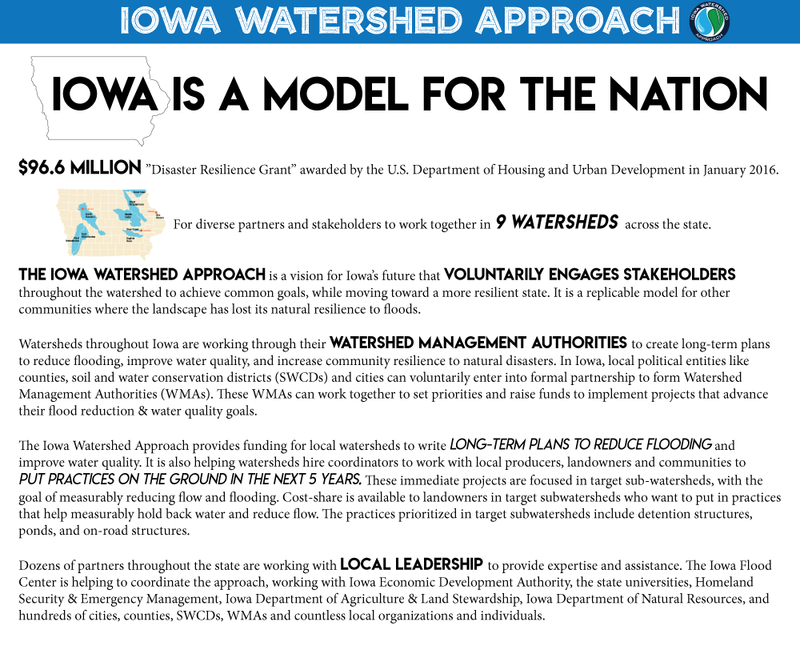 The Iowa Watershed Approach is making Iowa a national model in flood resilience! The Upper Wapsi is an amazing place! Click here to learn more about its communities, landscape, ecology, and land-use. Residents and landowners in the Upper Wapsi Watershed are invited to a series of Public Meeting Open Houses. Keeping communities and landowners in the Upper Wapsi protected from flooding. Learning about urban conservation practices that can beautify communities and help better manage stormwater to reduce flood risk. Exploring the many ways farmers & landowners are already practicing conservation on rural land–and considering opportunities to increase impactful conservation. Sharing their own perspective on the watershed–what they value, what they’re concerned about, and what they want to do to make the Upper Wapsi more resilient. No RSVP required, but if you have questions or want to let us know you’re coming, please contact Megan at Northeast Iowa RC&D: megan@northeastiowarcd.org, 563-864-7112. We hope to see you at one of the open houses! Rain gardens utilize good soil and deep-rooted plants to infiltrate runoff from a smaller area, such as a roof, driveway, or a section of street or parking lot. Often rain gardens are beautifully landscaped with brightly colored flowers that attract butterflies and other pollinators. Properly constructed rain gardens are in the natural path of runoff and are slightly depressed, but designed to infiltrate ponded water in under 24 hours. 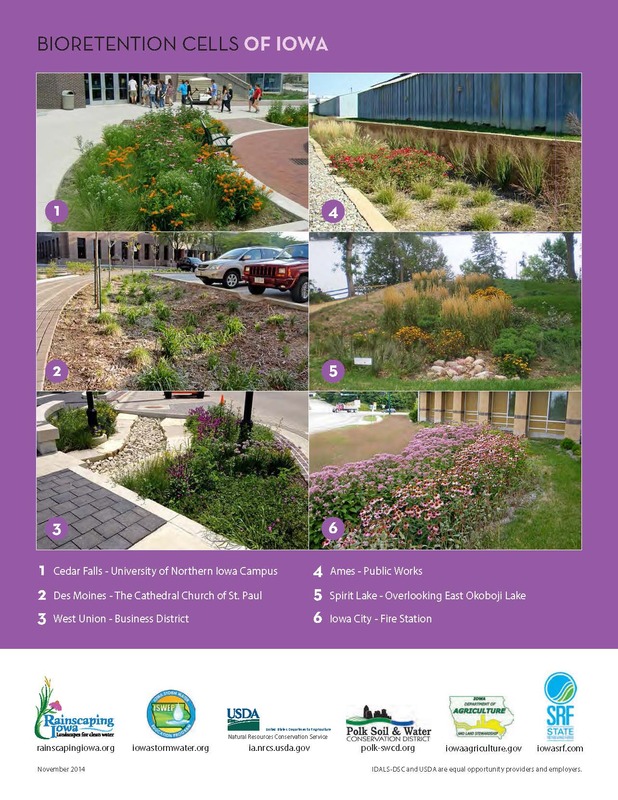 Check out Rainscaping Iowa’s rain garden resources to learn more! Rain gardens are another urban stormwater best management practice (BMP) you may want to consider using at home, at your business, or in your community! 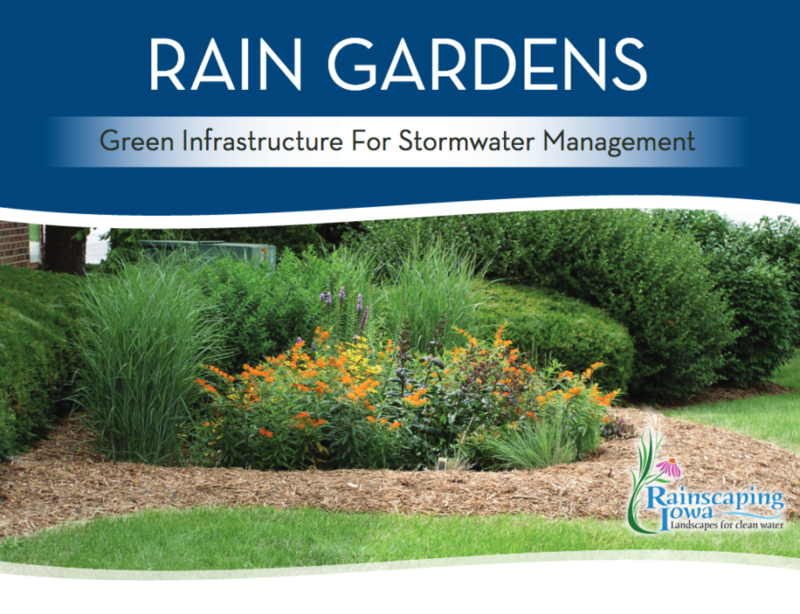 To learn more about urban stormwater BMPs check out Rainscaping Iowa, a project of the Iowa Storm Water Education Partnership. A bioswale can be used in place of a traditional storm sewer. Planted with deep-rooted native grasses, flowers, and shrubs, bioswales beautify while helping water filter and infiltrate. Bioswales work best when they are placed in existing drainage areas. By design, bioswales infiltrate frequent smaller rain events and convey heavy rains in a non-erosive manner. They do not hold water on the surface for extended periods of time. In fact, bioswales can be a good solution for areas that have problems with ponding and standing water. 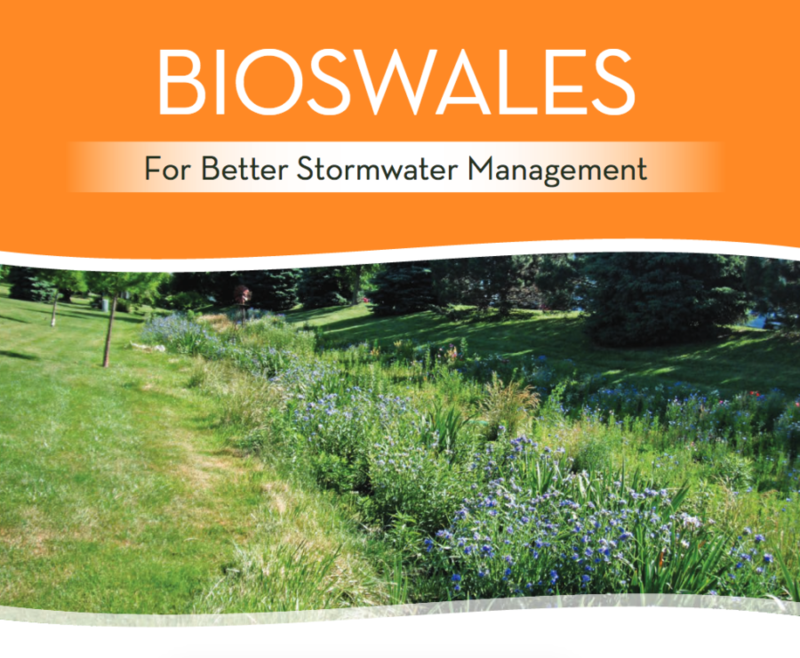 Learn more about bioswales at RainscapingIowa.org! Bioswales are just one of many green stormwater management practices that communities can implement. Check this page for more examples, or visit the Iowa Storm Water Education Partnership’s website to learn more! 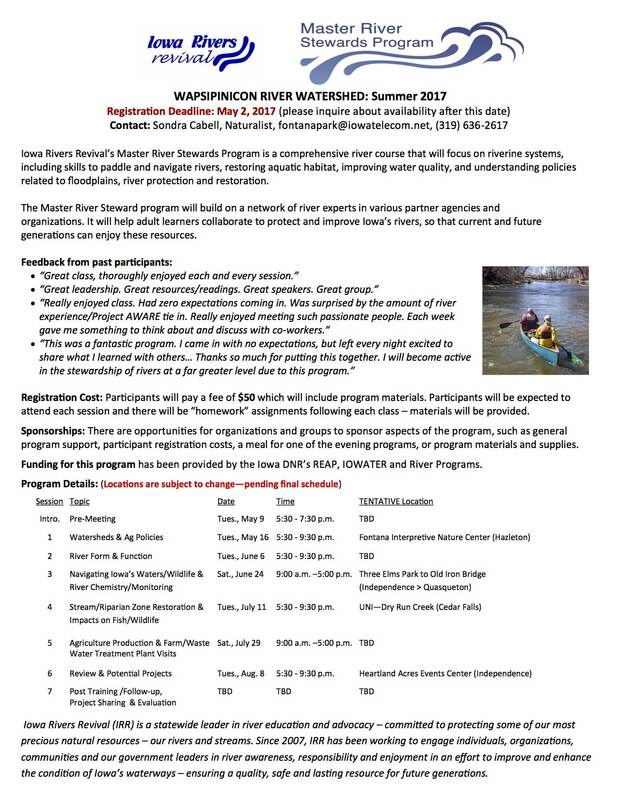 If you own property in the Upper Wapsipinicon Watershed, you may find a survey in your mailbox this summer. 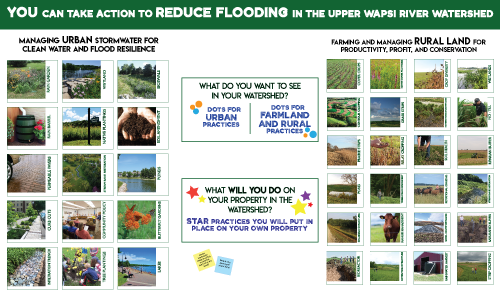 The survey is part of the planning process the Upper Wapsipinicon Watershed Management Authority (WMA) has undertaken in an effort to reduce the risk of flooding and improve water quality in the watershed. The Upper Wapsipinicon WMA, a formal partnership between 15 communities, 9 Soil and Water Conservation Districts, and 8 county Boards of Supervisors, is working with Northeast Iowa RC&D to create a 20-year plan for the watershed. 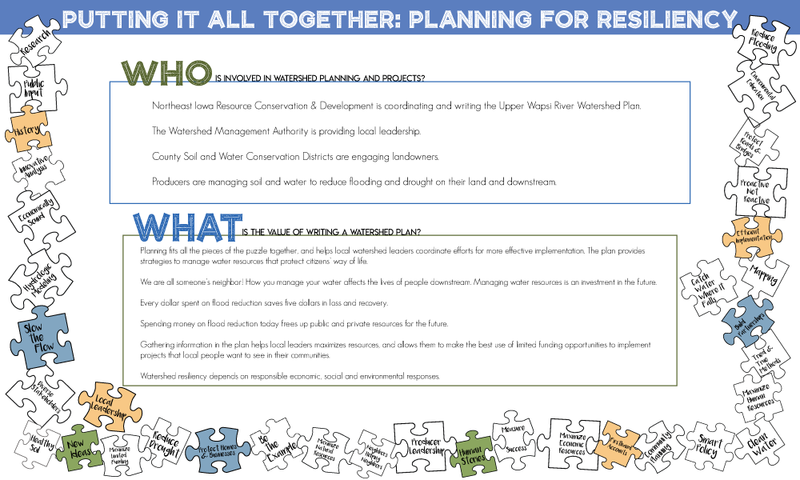 The first step in the planning process is learning about the watershed and the people who live in it. To that end, Northeast Iowa RC&D has begun evaluating land use, urban runoff, and other characteristics of the watershed. The survey, sent to 1,300 households, is one way landowners can give input to the plan. 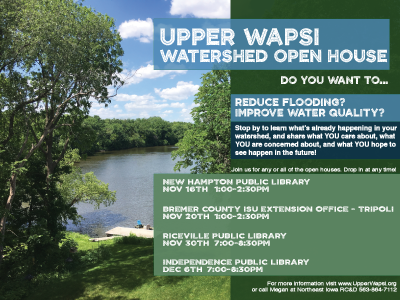 To learn more about the Upper Wapsipinicon Watershed, scroll around this website or contact Megan at Northeast Iowa RC&D at 563-864-7112. Elaine Hughes prepares to draw samples from Buffalo Creek near Quasqueton. A couple of times a month, volunteers collect water samples from streams, creeks and the Wapsipinicon River. Samples are sent to Coe College, where they are tested for nitrates, phosphorous, chlorine, sulfate and total suspended solids. Monitoring is a critical component of improving water quality. 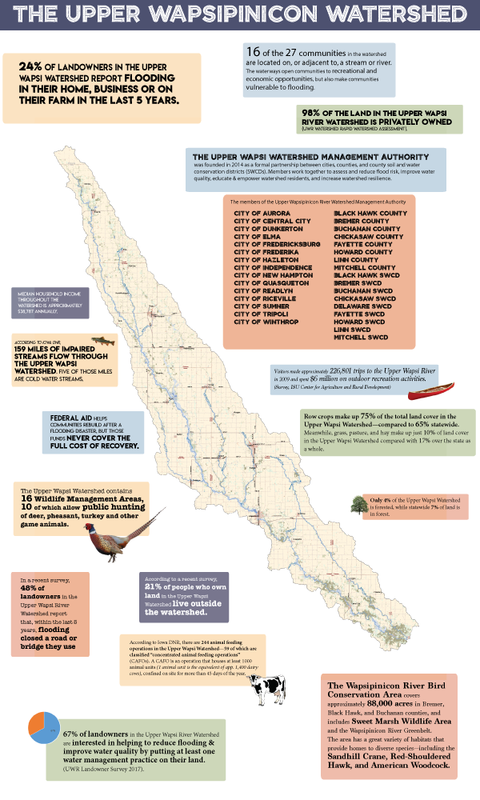 As the Upper Wapsi WMA sets improvement goals, the data collected can help them identify the most critical problems in the watershed and prioritize effective solutions.